More information about Ocean's integration with QHR Accuro. Normally, Ocean will automatically resynchronize appointments with the Accuro appointment schedule every 30 minutes. This is generally a sufficient time frame to have all the patients who need to fill out Ocean forms, loaded into Ocean. However, if you go to email a patient more than a week in advance of their appointment, you may sometimes find that they are not in Ocean yet. Not to worry - you can easily upload this patient into Ocean by using a Ocean online message CDS link or the "Fetch Patient" feature in the Ocean Portal. After your patient has been uploaded into Ocean, you can send the patient a message by clicking on their name, as you normally would. Once you've selected a patient in your Accuro EMR, you can use either the "Ocean Portal" or "Send Ocean Online Message" CDS link from the main target Accuro menu to directly upload a patient into Ocean, right from your EMR. 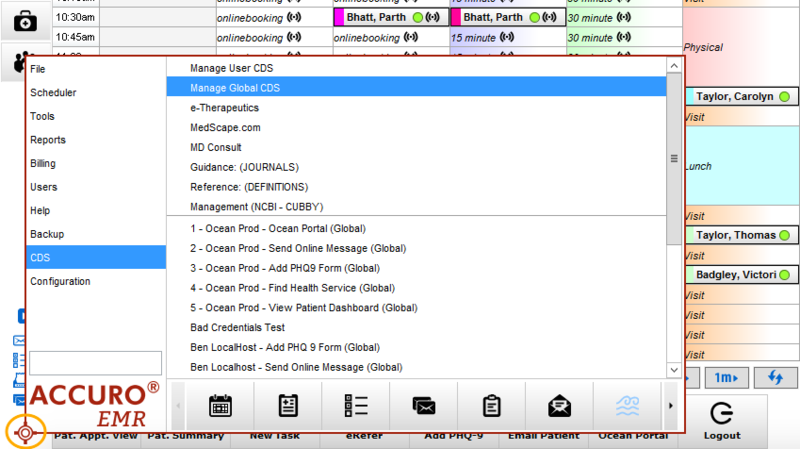 Once you've selected the CDS link for the patient, Ocean should upload the patient into less than 30 seconds. Once the patient has successfully been uploaded into Ocean, you should be redirected to either the Ocean Portal with the patient selected or the Ocean online message editor window. Ensure that the patient exists in Accuro already, with a health number in their chart. From within the same tab, enter the patient's health number into the "HN..." field, under "Fetch Patient". The patient will appear as a row containing "...", "...", the patient's health number and a clock symbol for a few seconds, while Ocean pulls the patient from Accuro. Once Ocean has found the patient, their name and information will populate (and the source of the patient will be "EMR"), signifying that the patient has been successfully uploaded into Ocean. When you are building your eForms, if you "tag" a caption by surrounding a single word with "@" and ": $$" then the value will be available for mapping using EMR field mapping. An example can be found in the screenshot to the right or in the note generated by this standard PHQ-9 questionnaire. Create a lab value in Accuro for your Ocean answer. Log in to your Accuro and enter the EMR section. Click on the green plus sign in the "Labs" area to create a new lab test. This will open up the Lab Tests dialog box, where you can add a new lab test by clicking on the green plus sign. This will open up the Edit Lab Tests dialog box, where you can add a new lab test result by clicking on the green plus sign. This will open up the Lab Results dialog box, where you can add a new lab test result by clicking on the New button at the bottom. This will open up the Edit Result dialog box, where you can define the data type and units. Leave the "Source Code" field blank. Click the green plus sign to add a reference range for your lab result (if applicable). Click "OK" when you're done editing your result. You should now see your new lab test result appear in your "Edit Lab Test" dialog box. Click "OK" to save your new lab test. Enter the "EMR Field Mapping" section. Add a new row and name the "Tagged Field" and "EMR Field" the exact same thing that you named your lab test. Now, if a patient completes a questionnaire with your lab value, the measurement will then be set in the "Labs" section of their Encounter Notes section of EMR section of Accuro. If you are experiencing an error while setting up Cloud Connect, refer to the table below. If you require further support, please feel free to submit a request to our support team to our support team.